Panasonic S1 & S1R Cameras Announced! WOW!!! Panasonic has officially just officially announced the new S series full frame mirrorless cameras: Panasonic S1R and Panasonic S1. Panasonic S1R has a 47MP sensor while S1 has 24MP. They both use the Leica L-mount lenses. 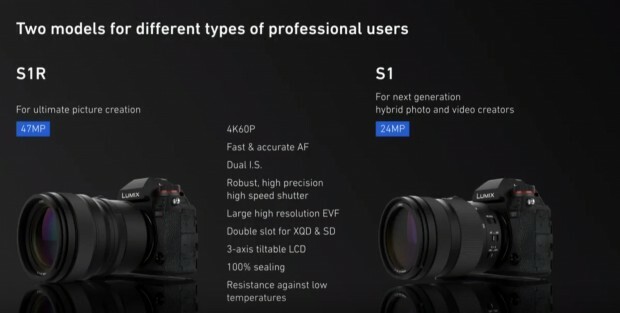 The prototype versions of the S1R and S1 will be displayed at Photokina 2018 and launch date in “early 2019”. Panasonic have been targeting professionals with their high-end Micro Four Thirds mirrorless cameras, the GH5s, GH5 and G9, but they feel that they still have some room to expand upwards, hence this development announcement of a completely new system camera with a new sensor format (for Panasonic). Panasonic haven’t forgotten their 10-year-old Micro Four Thirds line-up though, promising to focus on both categories, which will co-exist and grow simultaneously. Prototype versions of the S1R and S1 will be displayed under glass at Photokina 2018, with a promised simultaneous launch date for both models of “early 2019”. Panasonic aren’t giving too much away about their new cameras just yet, but they confirmed to us that the S1R and S1 will have completely new image sensors, a new Venus Engine processor, dual image stabilization (lens and body), an Artificial Intelligence deep learning system for fast and accurate auto-focusing, 4K 60P video recording, and high-quality lenses. Each camera has an XQD and SD dual memory card slot, a 3-axis title LCD touchscreen, a perfectly sized grip, optimum button layout, and a market leading electronic viewfinder (EVF). They will have an extremely durable shutter, 100% weather sealing, and low temperature resistance (down to -10 degrees). Note that no official measurements or weights have yet been provided, and the design may change before final launch. All of the control dials, buttons etc were glued into place and the camera didn’t turn on, so we can’t comment on the operation of the S1R/S1 yet. Panasonic have also unveiled three new lenses for their full-frame system, called the Lumix S Series of lenses. 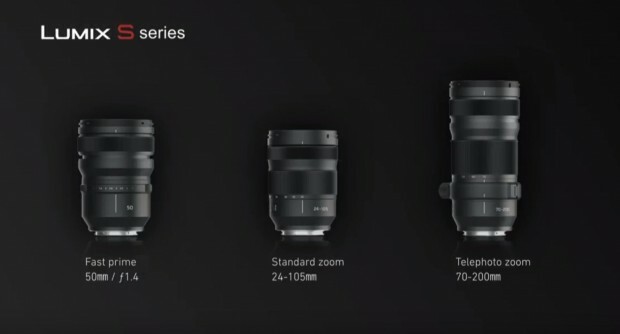 There will be a 50mm f/1.4, 24-105mm and 70-20mm available at the same time as the launch of the S1R and S1 cameras (no aperture info has yet been provided for the two zooms). They will offer ultimate high resolution, high speed auto-focusing, Dual image stabilization, and impressive solidity and bokeh. All three will have a physical aperture ring, although there was no obvious way to de-click it for video use on the early prototype of the 50mm f/1.4. Panasonic are also publishing a lens roadmap, with 10 lenses in total due for release by the end of 2020, a promising start. But that’s not all. In an exciting and rather unprecedented move, Panasonic have joined forces with Leica and Sigma to form the L-mount Alliance. All three companies will develop full-frame cameras and lenses that use the Leica L-mount standard. Along with Panasonic’s three new Lumix S lenses, Leica already have eight native L-mount lenses (five primes and three zooms), along with a range of adapters that allow Leica TL, M, S, R and Cine lenses to be used on L-mount cameras. With Sigma also introducing their own L-mount lens range, this ensures that there will be many lenses available for the Panasonic S1R and S1 from day one, at a wide range of price points, which gives them a distinct advantage over Nikon’s and Canon’s fledgling full-frame systems, and allows them to quickly play catch-up with the market leader, Sony, who now have 30 native e-mount lenses. Panasonic haven’t forgotten their loyal MFT users, announcing the development of the world’s first constant aperture f/1.7 wide zoom lens, the Leica DG Vario-Summilux 10-25mm f/1.7. Lumix Pro is a brand new global marketing platform – www.lumix-pro.com – which also launches at Photokina. With the strapline “Pro is more than product”, Panasonic will offer 5 different tiers of support to their users – Basic, Silver, Gold, Platinum and Black – via a truly global programme. The company are also set to refresh their Global Ambassador program in the next few weeks. This entry was posted in Panasonic Camera and tagged Panasonic camera rumors, Panasonic S1, Panasonic S1R on September 25, 2018 by admin.